First of All, Download “Daron” Premium Theme. If you do not download yet (click here) to log in your account and download “Daron” Premium Theme. Then click on the option to upload theme. 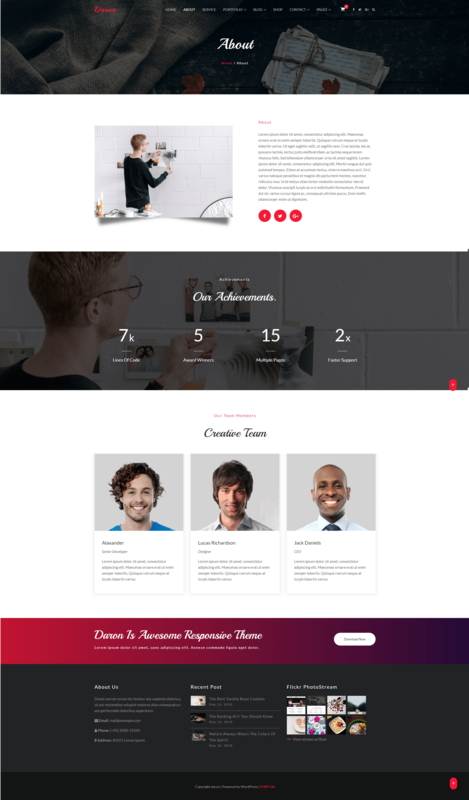 Go To WordPress site Appearance > Themes and activate Daron Premium Theme. Drag menu item left-right to make it under another menu(submenu). 1. Enable Button to show home page or custom page. 3. 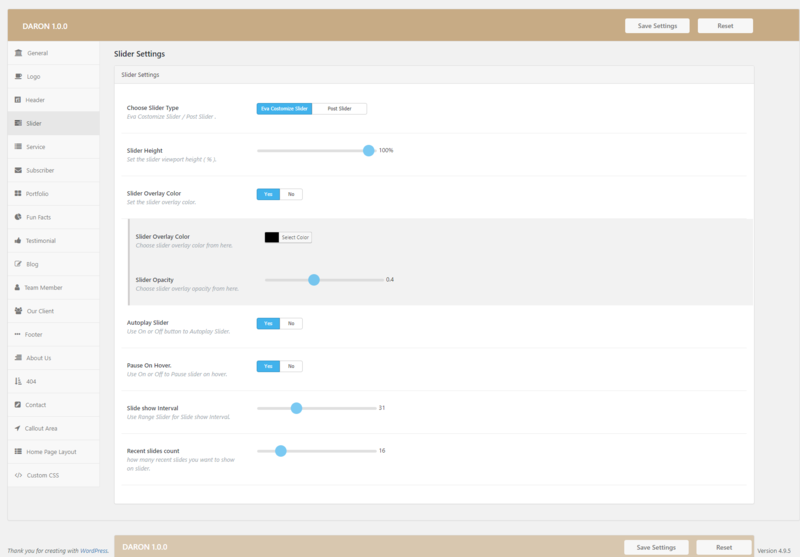 Theme Color Settings, You can set all the colors needed for customizing your theme here so that these colors will be available throughout the building process. This is a color to highlight different elements. Like text links, active tabs, progress bars, active accordion and others. See the changed color of front page section below. 4. Theme Layout to Specify the layout of the pages.Theme Layout background Image setting to Chang only for Your Boxed layout Background Image. 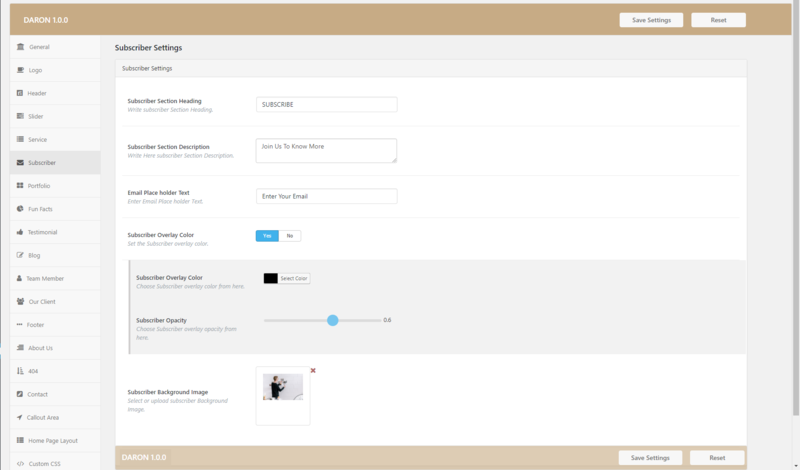 See the changed setting “boxed” theme layout below the image. 1. 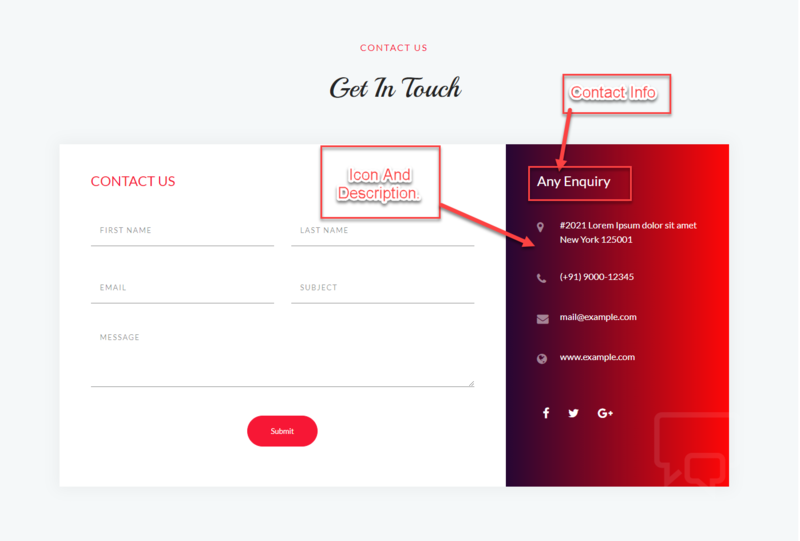 Logo Type Setting, This is where you can upload your own logo file or logo Text to appear in the header of every page of your website. There Is two Type of Settings into Logo Setting. a. Image Type Logo: When You Click on Image Logo Button You See Upload Image” button. You can use the “Upload Image” button below the field to upload your logo image click on it to upload your logo image then click on Save Options button to save settings. b. 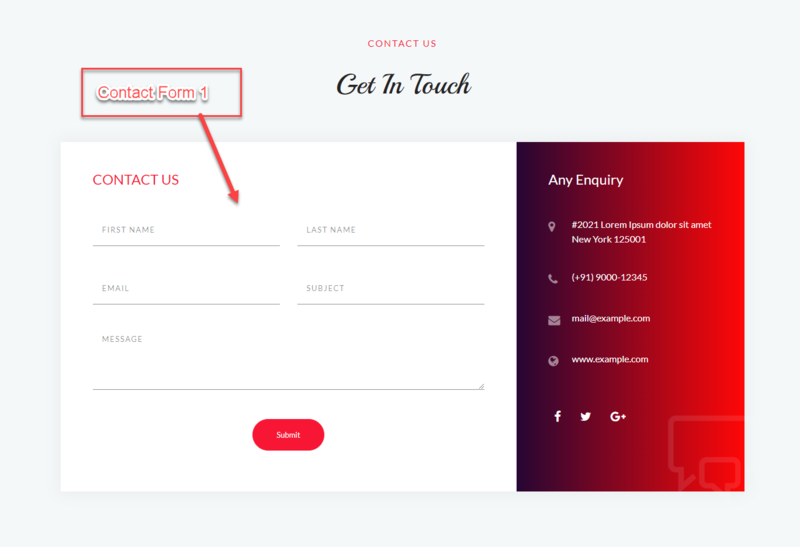 Text Type Logo: When You Click on Text Logo Button You will See an Input field, Write your Logo Title There then click on Save Options button to save settings. 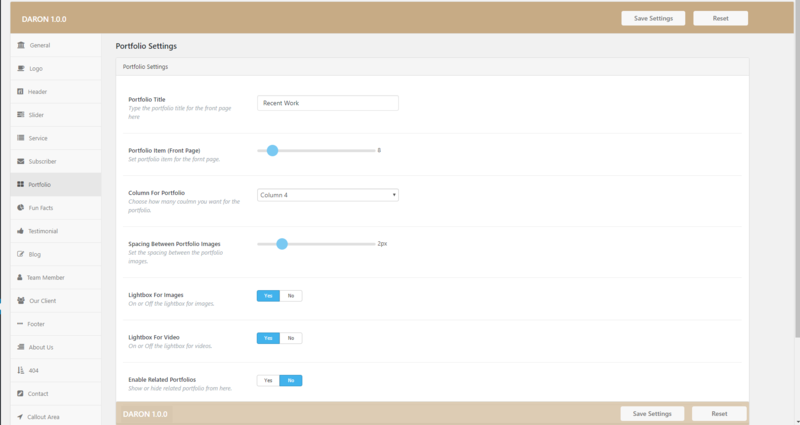 Slider Caption Alignment Setting, Specify the type of Slider Caption Alignment (Left / Right / Center). 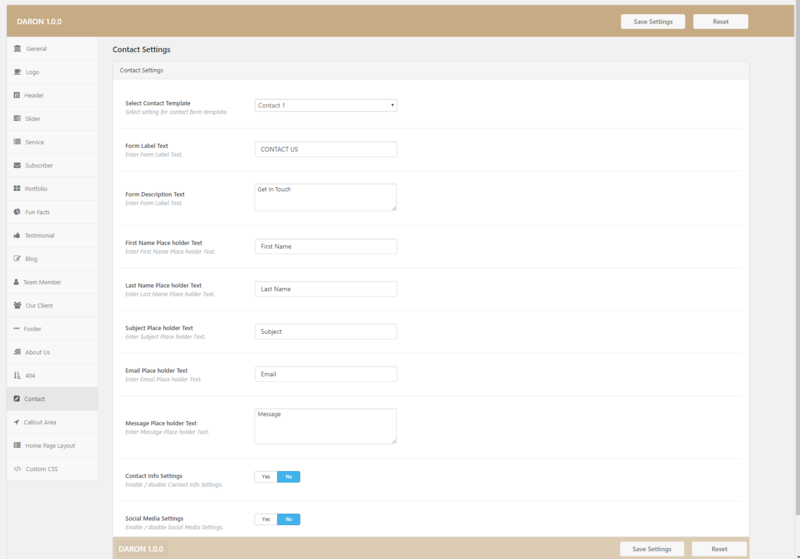 You can define your own Service Settings from within the Daron Theme Options page in your WordPress Dashboard. Then click on Service Menu Tab. 4. Service Column Layout, Select how many columns of services you want to show on Homepage. 5. A Number Of services on Homepage, Select how many Number of services you want to show on the Homepage. 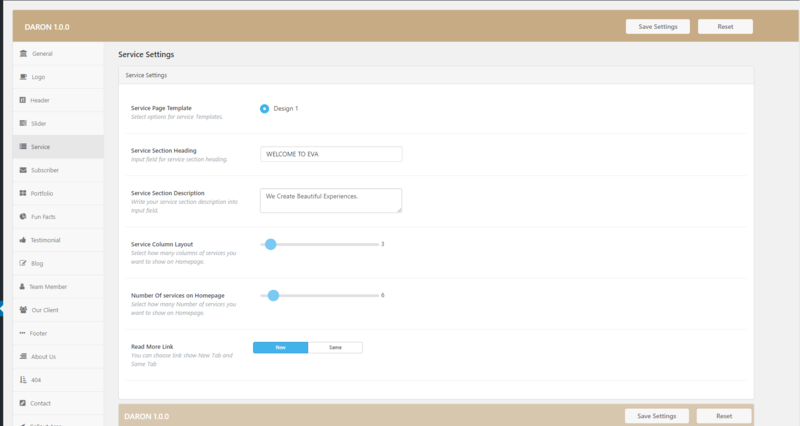 You can define your own Service Settings from within the Daron Theme Options page in your WordPress Dashboard. Then click on Subscriber Menu Tab. 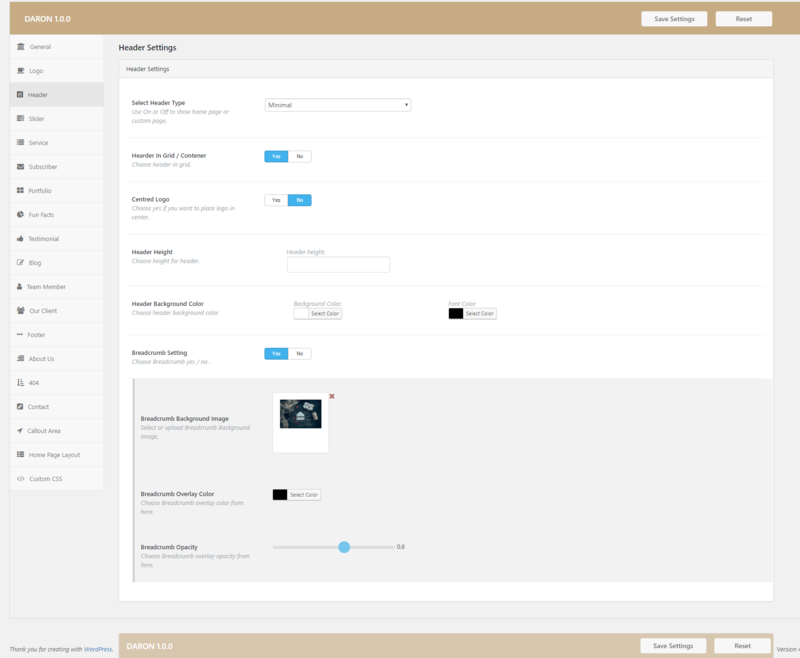 You can define your own Portfolio Settings from within the Daron Theme Options page in your WordPress Dashboard. Then click on Portfolio Menu Tab. 1. Portfolio Title Setting, Title of the front page “Title” area. (For front page only). See 8 items are shown below Image. 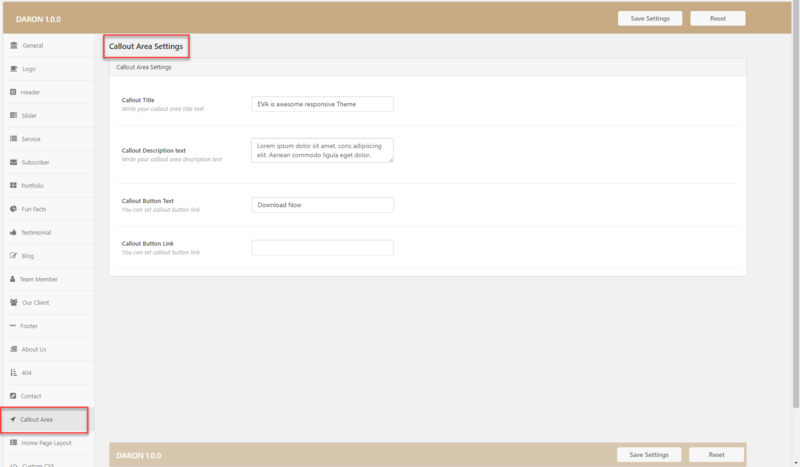 You can define your own Fun Facts Settings from within the Daron Theme Options page in your WordPress Dashboard. Then click on Fun Facts Menu Tab. 1. Facts Section Heading Setting, Write Fun Facts Section Heading. 2. Facts Section Description Setting, Write Here Fun Facts Section Description. 3. Fun Facts Column Layout Setting, Use Range Slider to set how many columns of Fun Facts you want to show on Homepage (2 columns, 3 columns & 4 columns). 4. Number Of Fun Facts on Homepage Setting, Select how many Number of Fun Facts you want to show on Homepage. 5. Fun Facts Background Image Setting, You can use the “Upload Image” button in the field to upload your logo image click on it to upload your logo image then click on Save Options button to save settings. 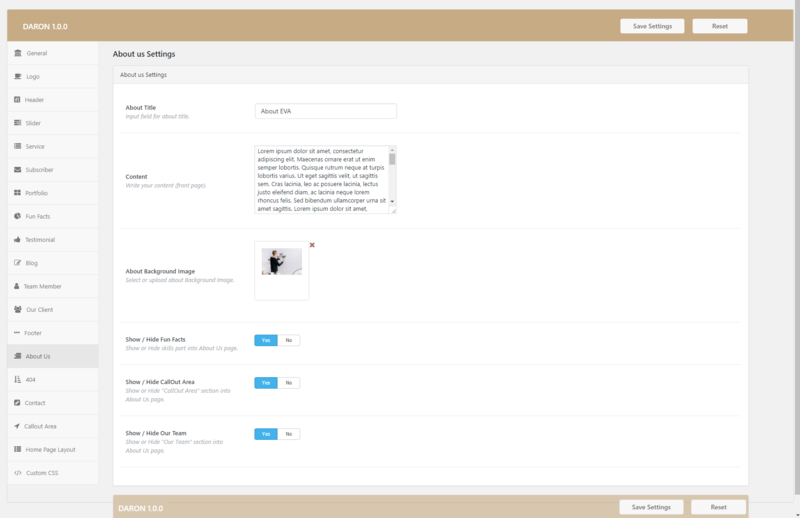 You can define your own Testimonials Settings from within the Daron Theme Options page in your WordPress Dashboard. Then click on Testimonials Menu Tab. 1. Testimonial Section Heading Setting, Use Input field for testimonial section heading. 2. 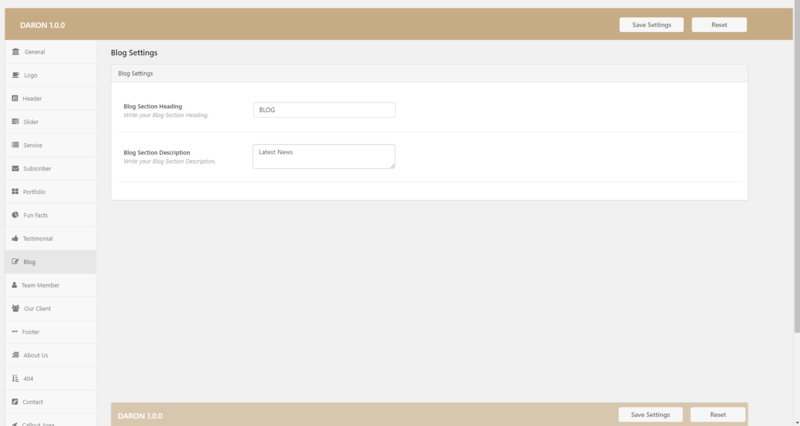 Testimonial Section Description Setting, Use Input field for testimonial section Description. 3. 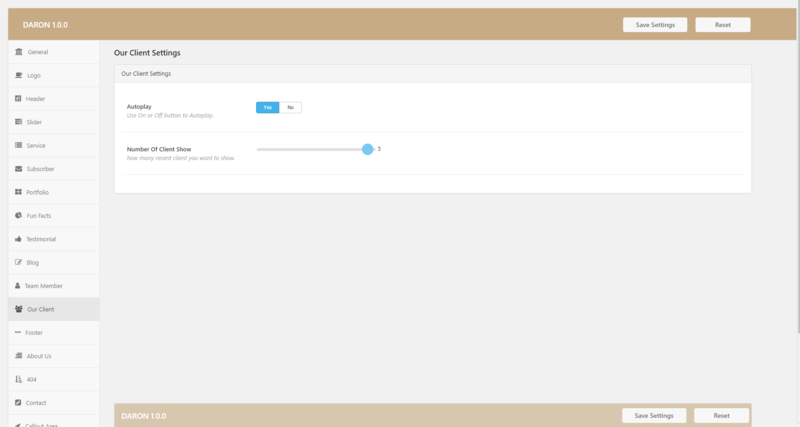 Autoplay Testimonial Setting, Use On/Off Button to enable Autoplay for Testimonial. 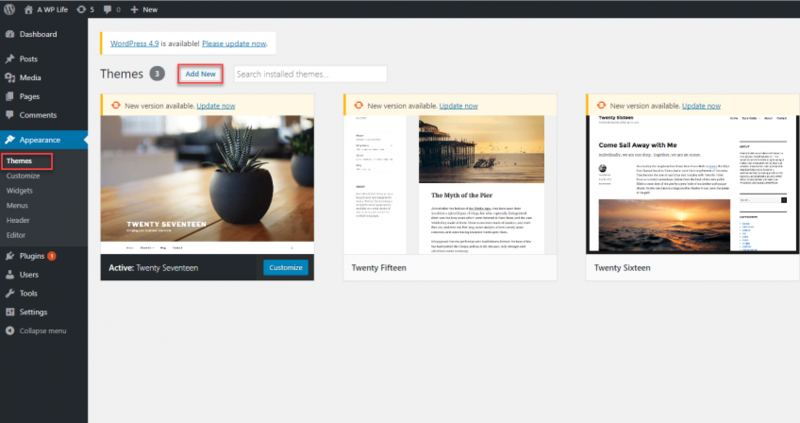 You can define your own Blog Settings from within the Daron Theme Options page in your WordPress Dashboard. Then click on the Blog Menu Tab. 1. 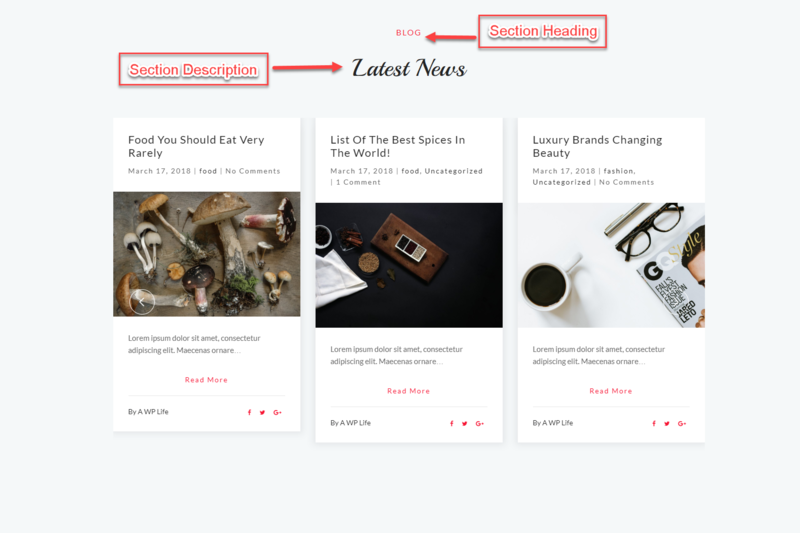 Blog Section Heading Setting, Write your Blog Section Heading. 2. 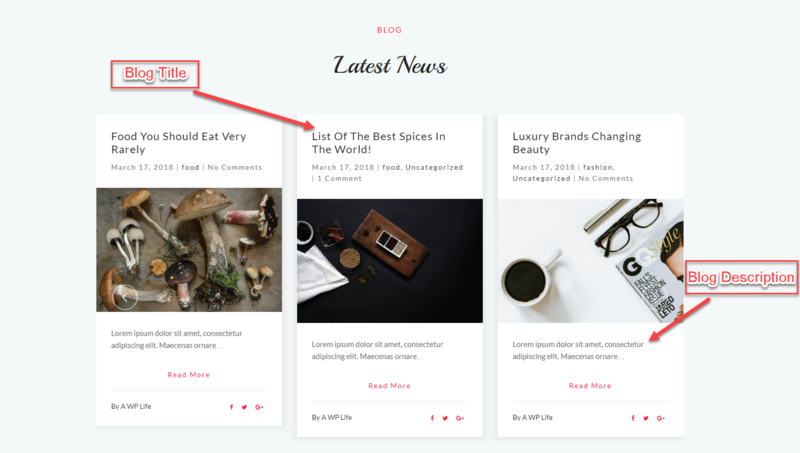 Blog Section Description Setting, Write your Blog Section Description. 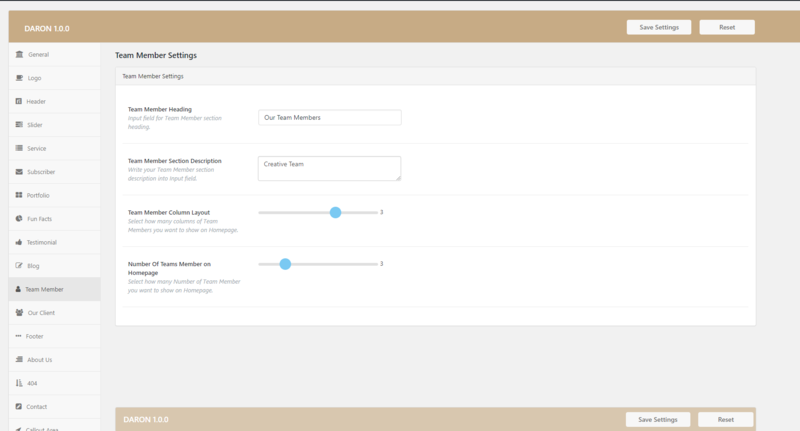 You can define your own Team Member Settings from within the Daron Theme Options page in your WordPress Dashboard. Then click on Team Member Menu Tab. 1. 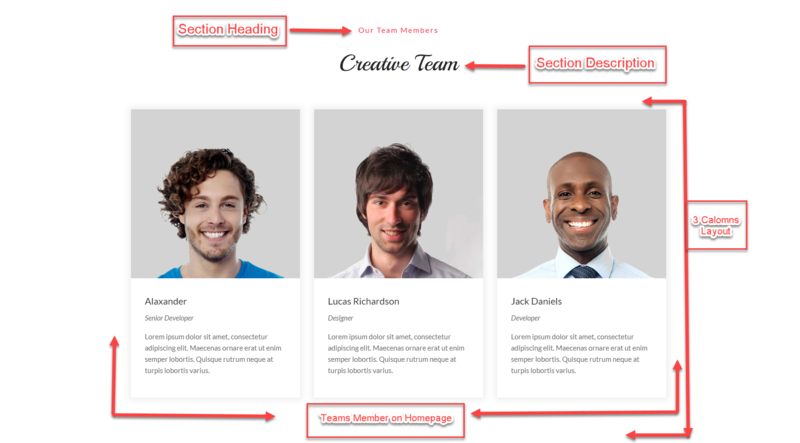 Team Member Section Description Setting, Write your Team Member section description into Input field. 2. Team Member Heading Setting, Write Your Team Member section heading. 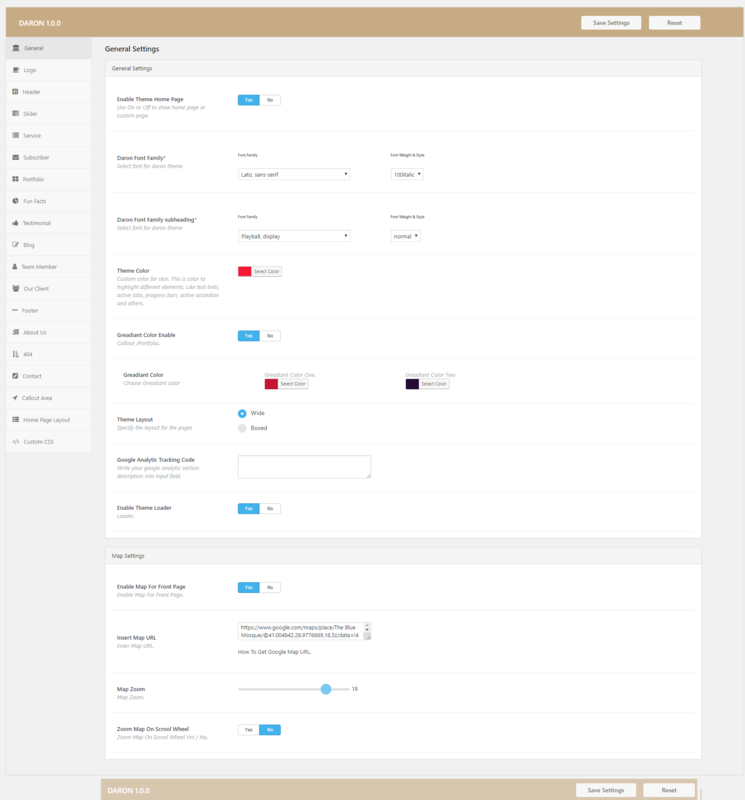 You can define your own Our Client Settings from within the Daron Theme Options page in your WordPress Dashboard. Then click on Our Client Menu Tab. 1. Autoplay Setting, Use On or Off button to Autoplay Client Slider. 2. A number Of Client Setting, Use Range slider to set how many recent clients you want to show Into Page. 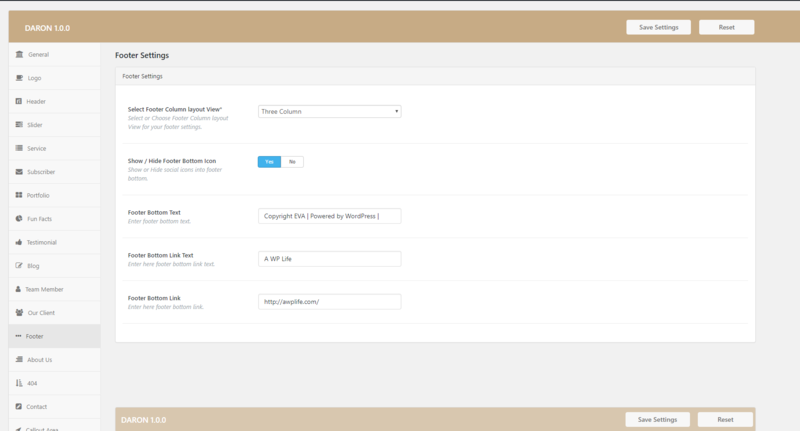 You can define your own Our Footer Settings from within the Daron Theme Options page in your WordPress Dashboard. Then click on the Footer Menu Tab. 2. Footer Bottom Text Setting, Use Input Feild to Enter footer bottom text. 3. Footer Bottom Link Text Setting, Use Input Feild to Enter footer bottom link text. 4. Footer Bottom Link Setting, Use Input Feild to Enter footer bottom link. 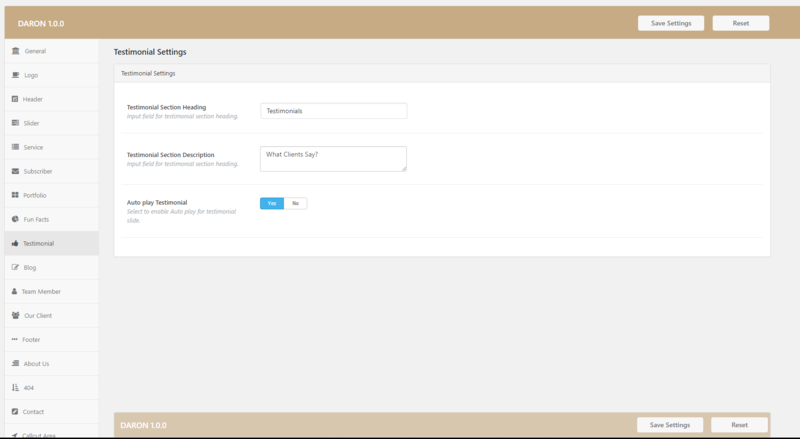 You can define your own About Us Settings from within the Daron Theme Options page in your WordPress Dashboard. Then click on About Us Menu Tab. 1. Show / Hide Fun Facts Setting, Use Radio Button To Show or Hide skills part into About Us page. 2. 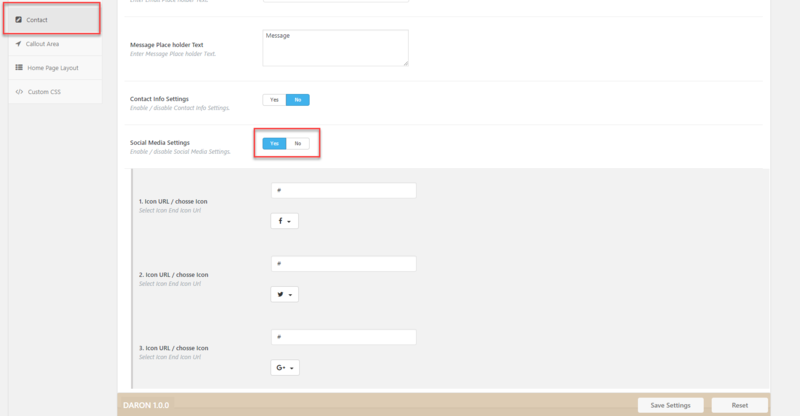 Show / Hide CallOut Area Setting, Use Radio Button To Show or Hide “CallOut Area” section into About Us page. 3. 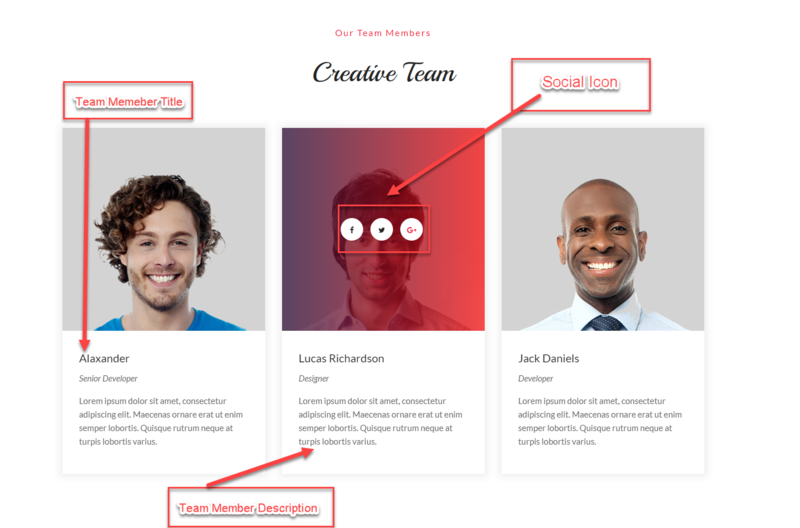 Show / Hide Our Team Setting, Use Radio Buttons to Show or Hide “Our Team” section into About Us page. 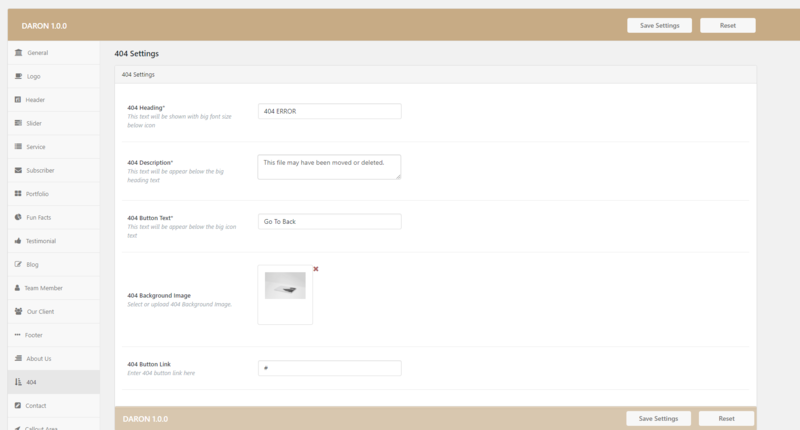 You can define your own 404 Error Settings from within the Daron Theme Options page in your WordPress Dashboard. Then click on 404 Error Menu Tab. 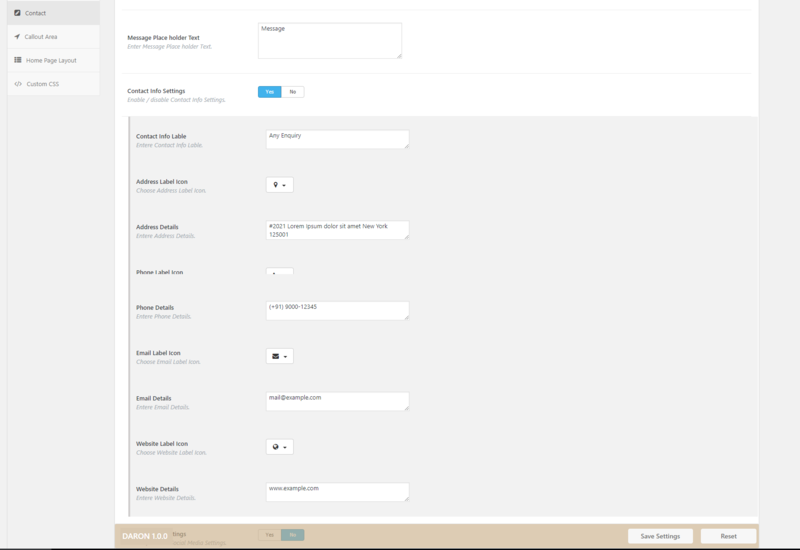 You can define your own Contact Settings from within the Daron Theme Options page in your WordPress Dashboard. Then click on the Contact Menu Tab. 2. Social Icon PIcker Setting, Use Icon Picker to set Social Icon. 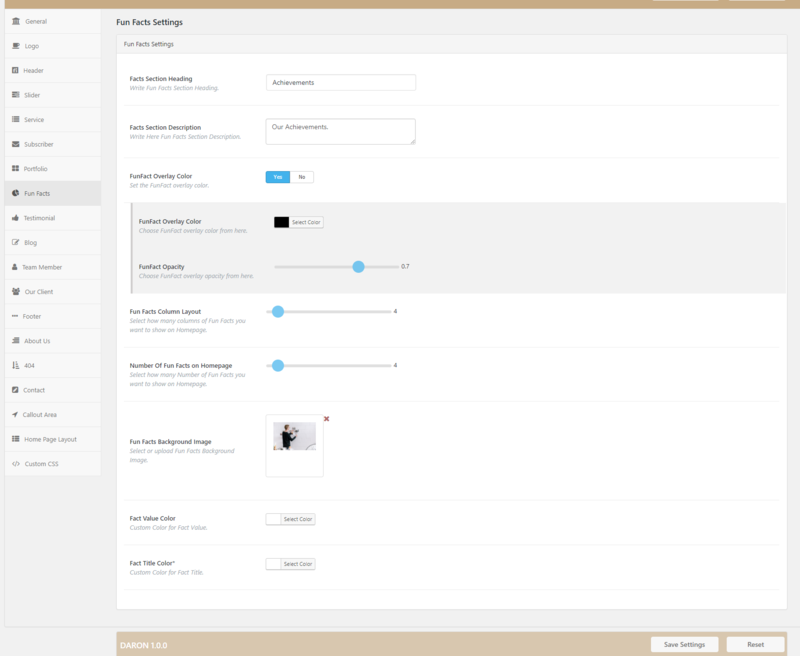 You can define your own Call-out Area Settings from within the Daron Theme Options page in your WordPress Dashboard. Then click on Call-out Area Menu Tab. 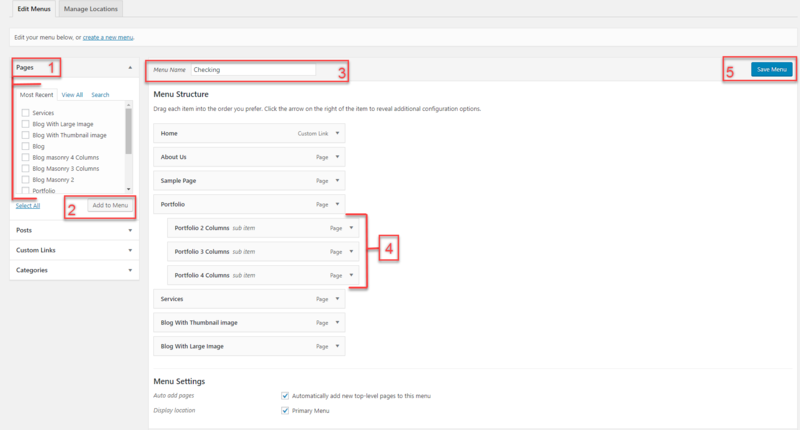 You can define your own Homepage Layout Settings from within the Daron Theme Options page in your WordPress Dashboard. Then click on the Homepage Layout Menu Tab. 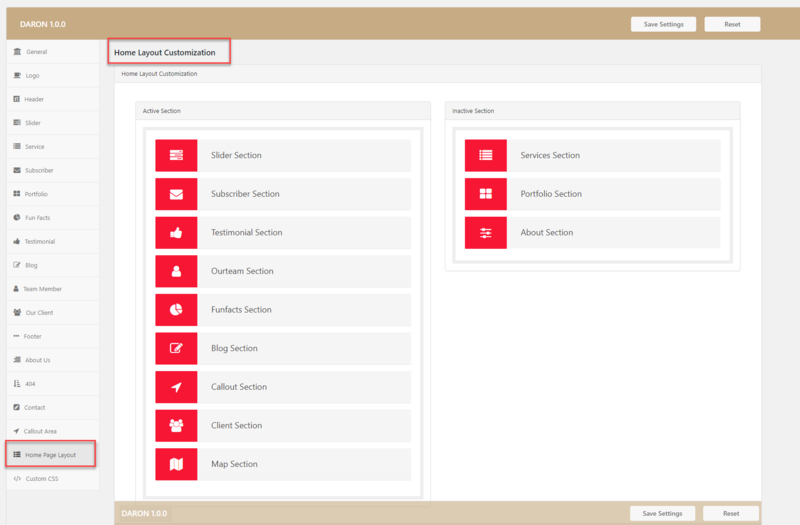 Using Home Page Customizer settings, sections on Home Page can be Adjust and remove. Here section can be active/inactive and move using DRAG N DROP.